Cyril Percy Callister, a chemist by training, became a food technologist and the inventor of the well known spread 'Vegemite'. A Ballarat School of Mines (SMB) student around 1910, Callister then went to Melbourne University where he obtained his B.Sc. in 1914, M.Sc. in 1917 and D.Sc. in 1931. With Sir David Rivett in 1931 he secured the royal charter for the Royal Australian Chemical Institute, becoming president of the Society of Chemical Industry of Victoria in 1935-36. 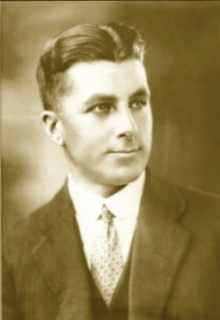 Vegemite, a yeast based spread, and perhaps one of most famous trademarks in Australia, was discovered around 1922 by Cyril Percy Callister. 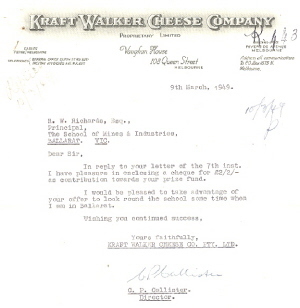 He was hired by the Fred Walker Company (a Melbourne based manufacturer later known as Kraft) as a laboratory assistant to develop a yeast extract spread. It took some years but by 1954 the special Vegemite song 'Happy Little Vegemites' demonstrated the popularity of the spread. Callister was also known for packing cheese in a can to preserve it and developing Kraft processed cheese. The son of a school teacher and postmaster he was born at Chute on 16 February 1893 and died on 5 October 1949. His brother Reginald Clive Callister (1889-1971) was also a student of SMB. Researched by Dorothy Wickham, December 2005. Image Caption RHS: Cyril Callister. (Photograph No. 490, Series 44, Kraft Heritage Collection). This image was kindly provided by Kraft Foods Limited.